On 10/10, the NY Dow tumbled by 831.83 points (3.14%) compared to the previous day, representing the third biggest drop in history. On the following day, 11/10, it fell 545.91 points (2.13%), plummeting by 1,377.74 points (5.21%) over two business days. The rapid rise of US long-term bond yield keenly watched by the market had triggered the tumble. The yield on 10-year US Treasury bonds had settled in the 3% range since 18/9, but had started soaring in October. As a result of economic indicators showing strength in the US economy, yields on 10-year government bonds rose to 3.25% on bond markets on 9/10, the day after the Columbus Day public holiday. Disliking the rise in interest rates, all the NY Dow constituent stocks fell on the following day, 10/10, resulting in a full market tumble. On 11/10, the VIX, which is also referred to as the “fear index” indicating investor sentiment, exceeded the upper limit of 20 of its usual range and rose to 28.84 at one time. On the same day, the day range of the NY Dow was about 783 points with wild fluctuations. With the continuation of record US stock prices and the US dollar appreciation against the Japanese yen, the intraday Nikkei average rose from a recent low of 22,172.90 points on 7/9 to a 27-year high of 24,448.07 points on 2/10. It had risen 2,275.17 points (10.26%) within 16 business days. 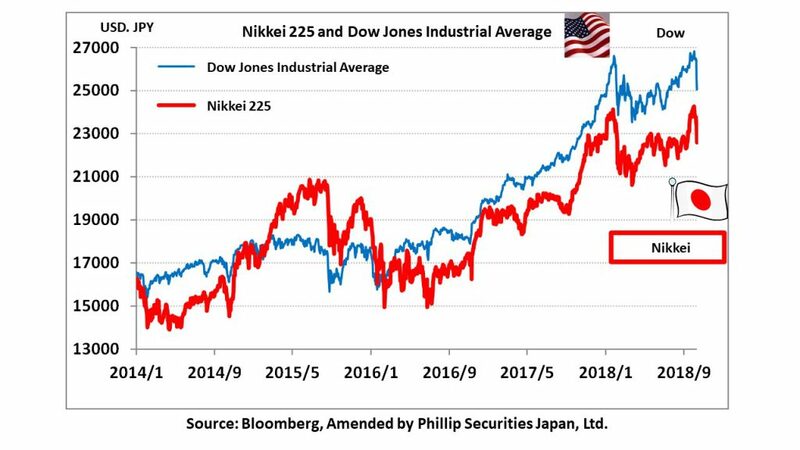 With this rapid rise in prices, Japanese stocks that had appeared overheated were affected by the sharp drop in Chinese and US stock prices which had entered the correction phase, and on 11/10, the Nikkei average plummeted 915.18 points relative to the previous day to 22,590.86 points. As a result, the Nikkei average RSI dropped down to the oversold region, with almost no limitation on the upward deviation from the moving average. For the time being, the lower limit is expected to revolve around the 200-day moving average of 22,500 points. The up-down ratio of the first section of the TSE, which had exceeded 130% at the end of September, had fallen below the neutral level of 100%. It is therefore possible that correction has reached the stage where the market regains calmness. Meanwhile, the possibility of the US and China resuming trade negotiations in November has also emerged. However, many in the market are viewing the 10-year US Treasury bond yield of 3.5% as the turning point for investment funds to change from risk assets to safe assets. Therefore, we need to pay attention to trends such as sudden movements in 10-year US Treasury bond yields. Keeping in mind that the US is in a stage where interest rates rise through normalization of monetary policies, we should therefore take into account that there may still be sudden unexpected market fluctuations. With the nearing of financial closings, be sure to check the performance of companies, identify good stocks that have room for evaluation based on factors such as valuation, and execute diversified investments focused on value-oriented stocks. In the 10/15 issue, we will be covering PAL Group HD (2726), Koei Tecmo HD (3635), Hokko Chemical Industry (4992), Hitachi Construction Machinery (6305), Advan (7463) and Sumitomo Corp (8053). ・Established in 1973 by separating from the casual division of Scotch Co., Ltd. In addition to selling clothing at stores for general consumers, also conducts business selling sundries. Prices are set between 300 yen to 1,000 yen, and pushing brands such as “3COINS”, “salut!” which sell fashionable sundries. 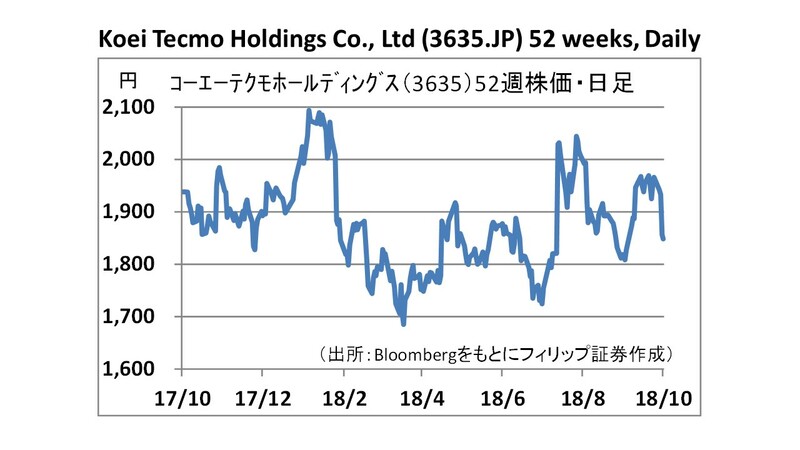 ・For 1H (Mar-Aug) of FY2019/2, net sales increased by 7.2% to 64.562 billion yen compared to the same period the previous year, operating income increased by 6.7% to 3.897 billion yen, and net income increased by 12.4% to 2.201 billion yen. Besides aggressive promotions in clothing items, company also implemented MD reforms. In the sundries business, 18 stores were opened in response to strong store opening requests as a result of increased name recognition. 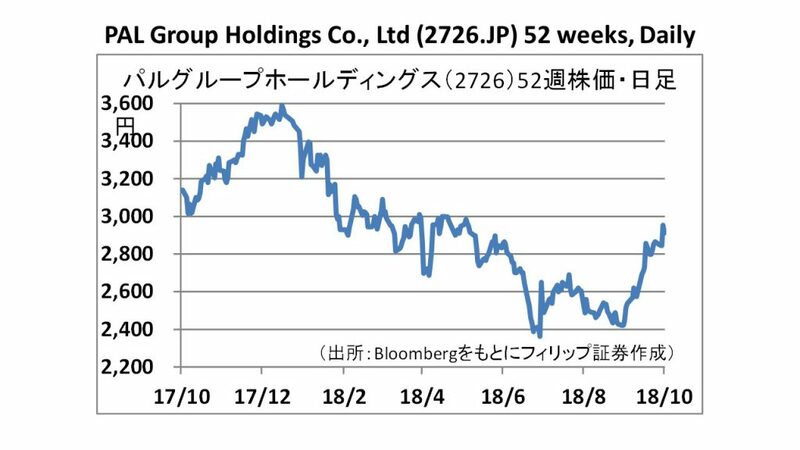 ・For FY2019/2 plan, net sales is expected to increase by 8.3% to 133.51 billion yen compared to the previous year, operating income to increase by 27.7% to 8.99 billion yen, and net income to increase by 98.1% to 4.93 billion yen. These are based on the assumption for internet mail order sales to increase by 35% to reach 20 billion yen with retail store sales remaining flat. Plan is also to improve gross margin by 0.9% by striving to reduce expenses. ・Established in 2009 through the merger of Koei and Tecmo. 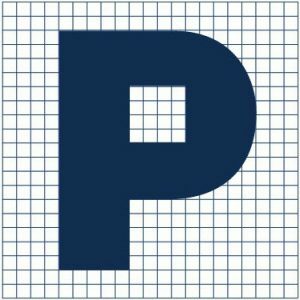 Develops and sells entertainment contents, contract develops liquid crystals for slot and pachinko machines, plans, operates and manages amusement facilities, operates and manages rental real estates and conducts venture capital business. Game titles include “Nobugana’s Ambition” and “Romance of the Three Kingdoms”. 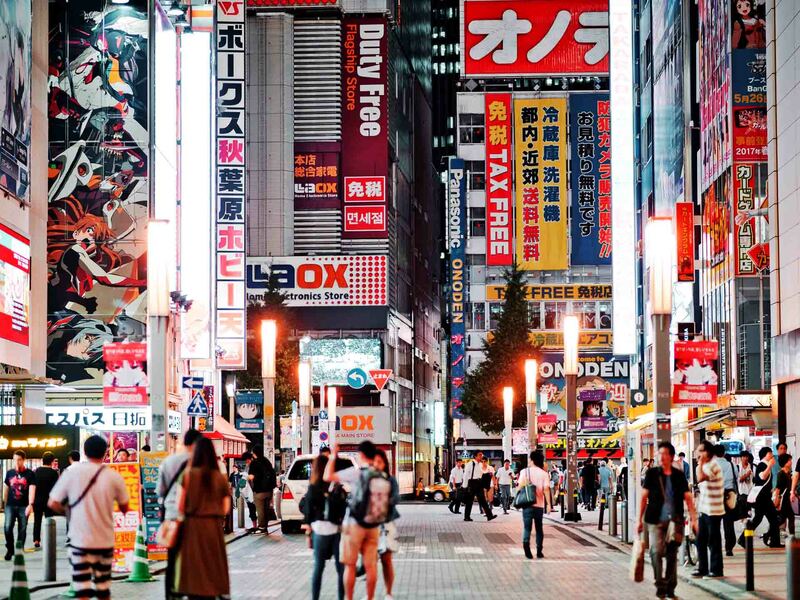 ・For 1H (Apr-Sept) of FY2019/3 preliminary results, net sales increased by 16.0% to 17.3 billion yen compared to the same period the previous year, operating income increased by 57.9% to 4.5 billion yen, and net income increased by 19.2% to 6.0 billion yen. “Zelda Musou Hyrule All Stars DX”, a collaboration between “The Legend of Zelda” series released in Europe and the US in May, and the “Musou” series, has performed well. ・For FY2019/3 plan, net sales is expected to increase by 5.3% to 41.0 billion yen compared to the previous year, operating income to increase by 2.5% to 12.0 billion yen, and net income to decrease by 4.0% to 12.5 billion yen. According to the company, the appearance of “PlayStation 4” and “Nintendo Switch” is expected to stimulate the home game market. Smartphone games centering on China are also expected to expand. Japan Weekly Strategy Report: Expect the Unexpected!